When it came to the design of this fantastic golf course in the middle of ‘pure desert’ along the Red Sea coastline, John & his team created a highly sustainable golf course that was a very challenging project both for the required water consumption and strong winds that affect the region at certain times of the year. To overcome this, a strain of paspalum was planted in the form of Sea Dwarf for the greens and Seashore for the fairways to ensure year round playability over 46Ha. This drought resistant grass can be resistant to high salt tolerances (ppm) and delivers a firm but fair playing surface for all levels of player. This was combined with 1200 date palms & 200 Washingtonians that represent the majority of the superb landscape. John’s team worked the topography to unseen shaping in the region; holes 11 and 16 are testimonies of this with their steep undulations from endless cut and fill that delivered two very exciting signature holes. 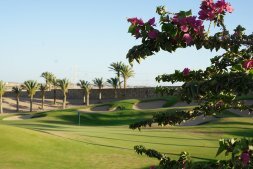 Sandford Design is no stranger to Egypt and has completed several other projects in the region, but it’s fair to say that John has somewhat of a ‘soft point’ for Egypt’s No1 Golf Resort.